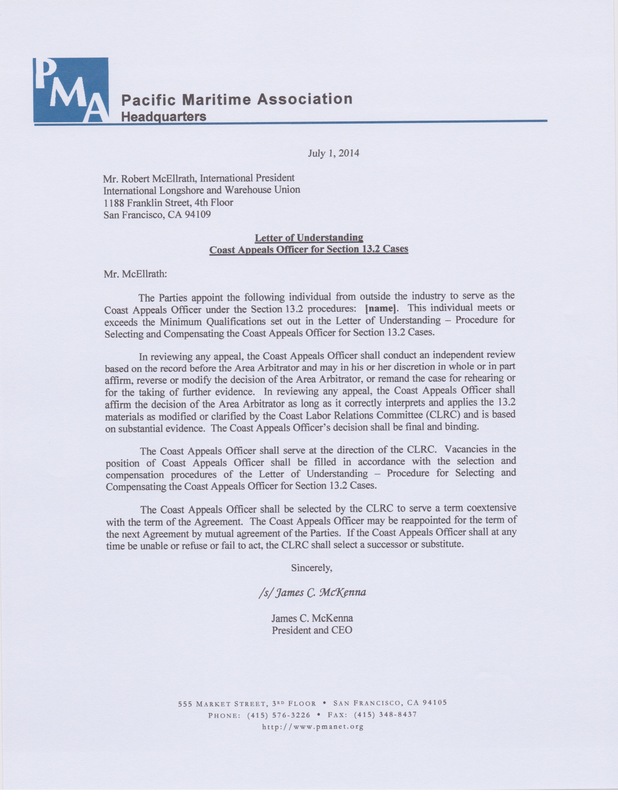 The ILWU/PMA Arbitration procedures are corrupt and dominated by International President “Big Bob” McEllrath. 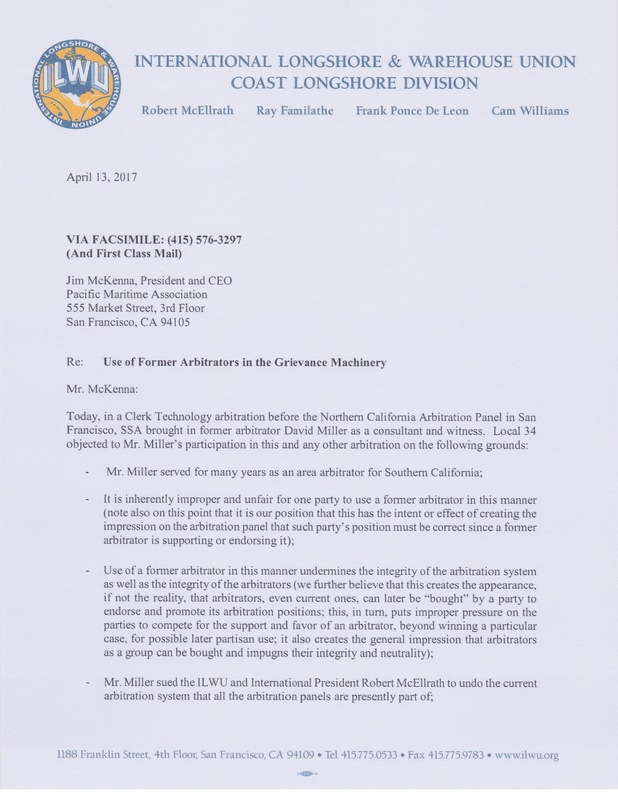 The following letter sent to PMA by the ILWU Coast Committee on Friday, April 13, 2017, shows just how corrupt. Big Bob got wind that David Miller, the Arbitrator he fired during the 2014 Contract negotiations, was going to be called as a witness in 2 Arbitration hearings and he went nuts. 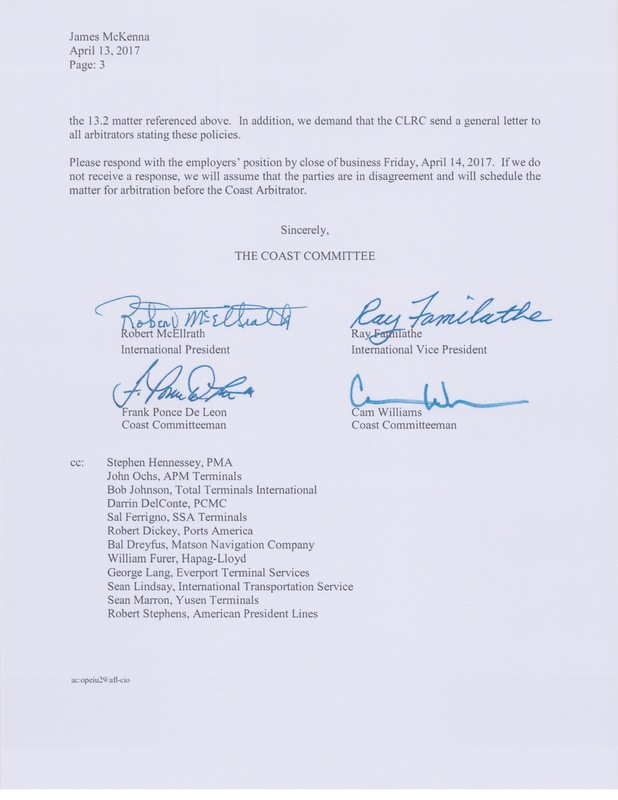 For along time, I have had the feeling that Big Bob has been interfering in the Section 13 Arbitration process, especially since he hired ILWU Attorney for the last 30 years, Larry Schwerin, as the Coast Appeals Officer. 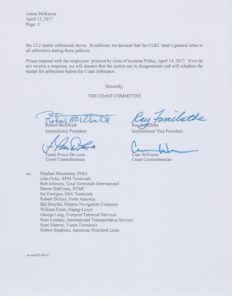 The April 13th letter that he and his Coast Committee sent to PMA, including the PMA Sub-Steering Committee, provides proof. Big Bob’s letter is almost entirely composed of fabricated nonsense and outright lies. Last week, PMA brought in former Southern California Area Arbitrator, David Miller, as an expert witness. About 40 minutes into the hearing Local 34 called for a caucus, then after about 30 minutes came back into the hearing, with 2 goons, and told David he had to go, that he was trespassing, and 911 would be called if he did not leave immediately. Big Bob’s April 13th letter makes it clear that he is the one objecting to David Miller’s participation, not Local 34. Big Bob is attempting to bully his way into getting David removed as a witness, the same way he got David fired in 2014, using his bully boy intimidation tactics and flat out lies. Bob and the Coast Committee are outright witness tampering. It is NOT “inherently improper and unfair for one party to use a former arbitrator in this manner,” and “Use of a former arbitrator in this manner undermines the integrity of the arbitration system as well as the integrity of the arbitrators,” is a bold faced lie and unsupported by any documentation. 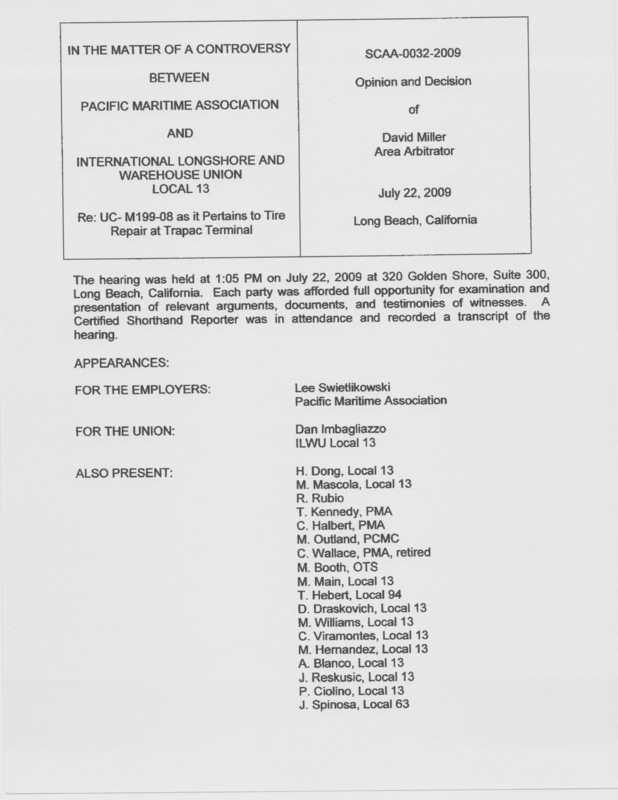 In fact, according to Arbitration Award SCAA-0032-2009, the Local 13 used Coast Appeals Officer/Arbitrator Rudy Rubio as a witness and Big Bob had no problem. Could that be because Rudy was going to say exactly what Big Bob wanted him to say? According to the Bible of Arbitration, How Arbitration Works by Elkouri and Elkouri, there is nothing what-so-ever wrong with using a former Arbitrator as an Expert Witness. Big Bob’s interference in the process by telling the Arbitrators that they cannot hear from witnesses, unless he says so, is illegal and unethical and someone needs to tell him so. Big Bob’s argument that Arbitrators can be “bought” by a party to endorse and promote its arbitration positions is not just speculation. Bob “bought” 30 year Union Attorney, Larry Schwerin, as Coast Appeals Officer. Larry Schwerin is NOT from outside the industry. 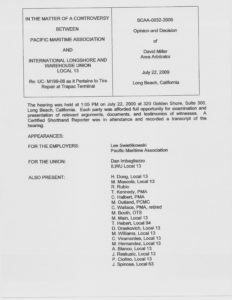 Larry Schwerin’s law firm has and still does represent ILWU Locals 19 and 23. Larry Schwerin does exactly what Big Bob tells him to do, because he has made millions of dollars from the ILWU and he does not want to lose his cash cow. 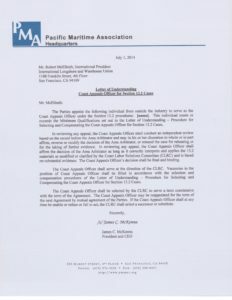 Contrary to Big Bob’s false claim, David Miller did NOT sue the ILWU to undo the current arbitration system, he sued for defamation and back pay. Read the David Miller – Lawsuit Statement of Facts for yourself. Bold faced lies and whining and crying are Big Bob’s standard negotiation tactics, and that is exactly what he is doing with his letter to PMA. David Miller’s presence as an expert witness was in no way a provocation or an intended offense against the Union, and sends no message that the Employers can; “unfairly manipulate the arbitration system by hiring a former arbitrator as a ‘ringer,'” that is just Big Bob whining and crying. Big Bob’s letter proves that he is interfering in the Section 13 Arbitration system as well. Bob claims it “came to our attention” that; “one of the parties” had cited David Miller as a witness in a Section 13.2 hearing (SPSC-0006-2017). How did it “come to our attention?” Was it a result of the Special LRC called by Local 13 to complain about David Miller being listed as a witness? How could Big Bob possibly understand what a witness is going to testify to if he never talked to either the witness or the charged party’s representative? 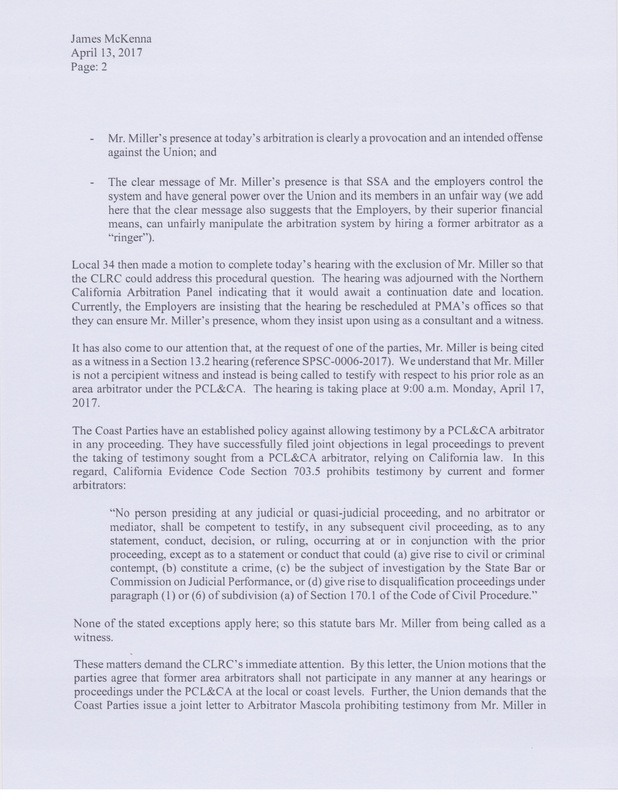 The parties DO NOT have an established policy against allowing testimony by a PCL&CA arbitrator in any proceeding. If they did, then how did Rudy Rubio testify in SCAA-0032-2009? Big Bob is NOT a lawyer, and “the coast” has not and does not wish to be bound by rigid formal Arbitration procedures, so why is he misquoting the law? More deception and bluff? 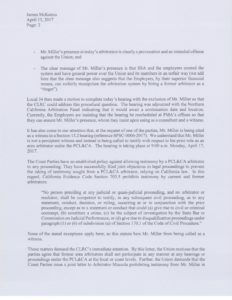 This is NOT a law suit and nothing bars David Miller from being called as a witness, in any grievance hearing, period. Someone needs to tell Big Bob that he is not the biggest kid in the sandbox and whining and crying and lying, will NOT get him his way. Oh, and thanks for the letter Big Bob, I will be using it with my NLRB charges regarding Section 13 and a longshoreman doing time off over a political cartoon. « Local 23 and Dean McGrath agree to settle NLRB charge, on the morning of the Hearing.